Former world champion Casey Stoner will miss at least the next three MotoGP races with the on-going health issues that have dogged the factory Ducati rider in recent weeks. An official announcement due to be released later today by Ducati is expected to confirm that the 23-year-old will definitely miss this weekend’s Czech Republic GP in Brno. 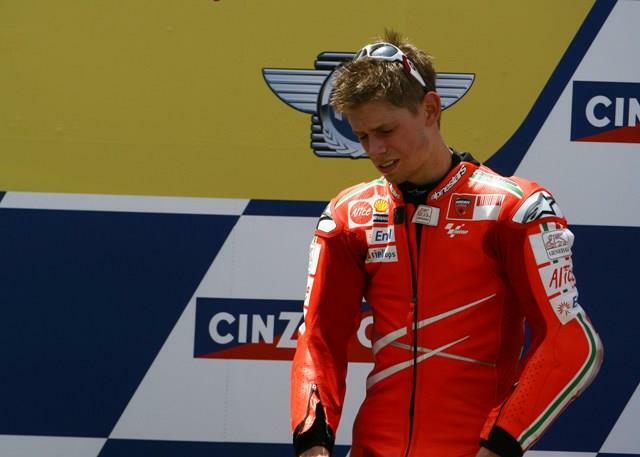 But MCN sources in Australia have confirmed Stoner will miss the Brno, Indianapolis and Misano races. Stoner has struggled since the Catalunya GP with chronic fatigue but the precise cause of his physical problems remained a mystery after he underwent extensive tests in California immediately after the American GP at Laguna Seca in July. Details of further medical tests Stoner underwent during the summer break in Australia have not yet been released. His shock withdrawal kills off his world title aspirations and leaves what was a thrilling world championship fight now effectively a two-horse race between Fiat Yamaha duo Valentino Rossi and Jorge Lorenzo. Stoner won the opening race of the season in Qatar and further boosted his title credentials when he won the Italian GP in Mugello for Ducati, ending Rossi’s golden run on home soil. But since that race, Stoner’s health has suffered, and as a consequence so has his results. He hadn’t claimed a podium in the previous three races and his title hopes took a massive dent at the recent British GP when he opted to run wet tyres in what was a curious gamble. Ducati is not expecting the 2007 world champion, who has been the lynchpin behind Ducati’s MotoGP assault, to be back until the Estoril GP in Portugal next month. Finnish rider Mika Kallio will be promoted from the Pramac satellite team to race next to American Nicky Hayden in Brno this weekend. And factory World Superbike rider Michel Fabrizio will fill Kallio’s GP9 slot next to rookie Niccolo Canepa.